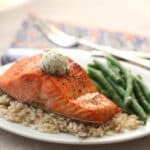 Broiled Salmon is a quick and easy weeknight dinner that looks and tastes fancy enough for a special occasion. Served with a simple herb butter, rice, and vegetables, this meal comes together in very little time. 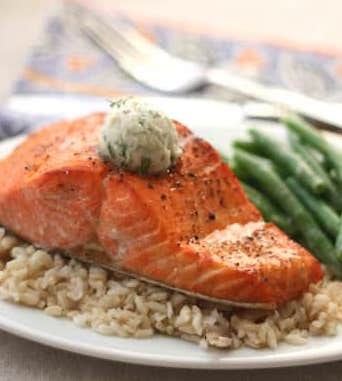 Serve this broiled salmon over rice along with some buttery green beans. You have to love a meal that comes together, start to finish in under 30 minutes. Starting the rice before the salmon and then steaming or sautéing some vegetables while the salmon cooks means that everything will be ready to serve at the same time. What’s not to love about a tasty and hassle free dinner that scores bonus points for being a healthy option as well? If you are a friend of mine on Facebook, you might have laughed with me the first time I tried broiling salmon. When you change your mind at the last minute and decide to broil dinner instead of baking it, it is smart to remove the parchment paper from the pan. Just a friendly tip, in case you don’t want to light that paper on fire. Luckily, I was still in the kitchen and was able to quickly transfer the unharmed salmon to a clean tray. First, do not use line the tray with parchment. Learn from my mistakes, friends. Lightly grease a baking sheet with olive oil. Feel free to line the baking sheet with foil to make cleanup easier, just oil the foil instead. Place the salmon on the baking sheet and squeeze lemon generously over the salmon. Drizzle lightly with olive oil and then sprinkle generously with salt and pepper. Broil for about 8-10 minutes, until the salmon barely flakes with a fork. I typically serve salmon with Rice Pilaf or simple steamed rice. Sriracha Honey Roasted Broccoli works well with salmon, as do these Simple Skillet Green Beans or this Asparagus with Peas and Basil. Kitchen Tips: I use this baking sheet to make this recipe. Preheat the oven to broil. Lightly grease a baking sheet with olive oil. Place the salmon on the baking sheet and squeeze lemon generously over the salmon. Drizzle lightly with olive oil and then sprinkle generously with salt and pepper. Broil for about 8-10 minutes, until the salmon barely flakes with a fork. While the salmon is in the oven, mix together the butter, dill and pepper. Place in the refrigerator to chill until ready to serve. When the salmon is finished cooking, serve each fillet with a small scoop of butter on top. Enjoy! lol.. oh I'm so glad I'm not the only one that has left parchment paper in the oven when I decided to broil instead of bake!!! The salmon looks incredibly good.. and I'm loving compound butter too! 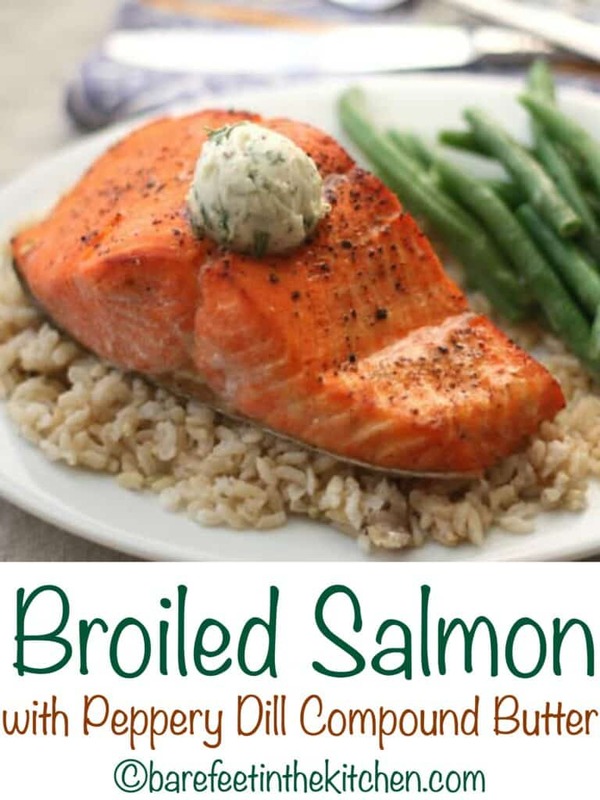 I love broiled salmon, and having some compound butters on hand would really kick it up a notch. I'll keep your parchment paper tip in mind! I want this for dinner. It looks elegant and delicious. That little scoop of peppery butter has my name written all over it! I am so bad at cooking salmon. I can never make it taste as good as when I go to a restaurant. Maybe a little butter would help! Thank you for sharing another delectable recipe and post. This whetted my appetite for dinner! I hope you have a love-filled week, my friend! Oh I must try compound butter! I've seen a few recipes and still haven't tried it. I'd make it in bulk so that I could put it on salmon, steak, chicken, even spread it on toast! I love dill and your salmon looks like it turned out perfectly! Looks so delicious! And that compound butter, I going to have to try that! 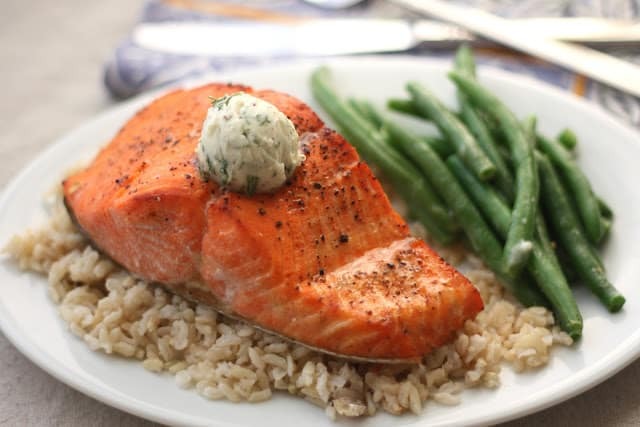 Herb butter is one of my favorite condiments to use when making salmon for the family. Thanks i can add this to my diabetic recipes with out the rice of course!